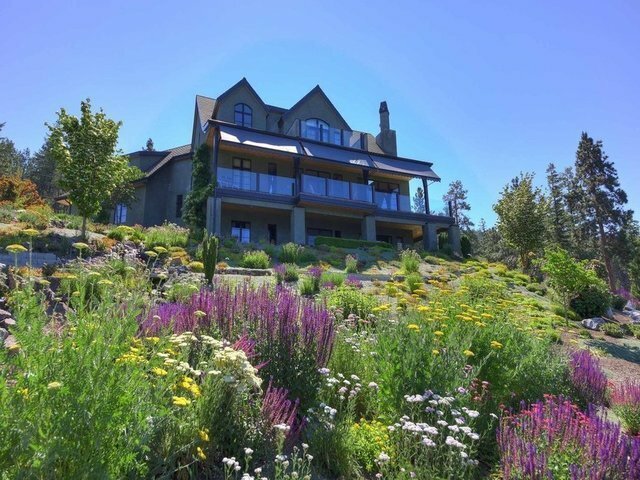 2820 Shayler Court Architecturally designed and custom built French Manor inspired home with private inner courtyard set amidst a park-like 8 acre setting on the shores of Okanagan Lake. High pitched roof lines, decorative arches, dormer windows, 100 year old fir beams that compliment both interior & exterior design speak to the old world style of this timeless residence. Upon entering the home, you are impressed with the natural lighting, gleaming Walnut floors, arched windows that capture the outstanding view and the award winning kitchen. Home offers high tech features, Lutron sound, security system & custom main floor media room. An oasis in the master suite with soaring ceilings, private view balcony, steam shower, soaker tub and his and hers walk-in closets. Artfully designed natural rock walls & a delightful landscape thoughtfully executed to offer a colorful display throughout the Spring, Summer and Fall seasons. Oversized parking areas, attached double garage and detached oversized garage.